Excellent post! 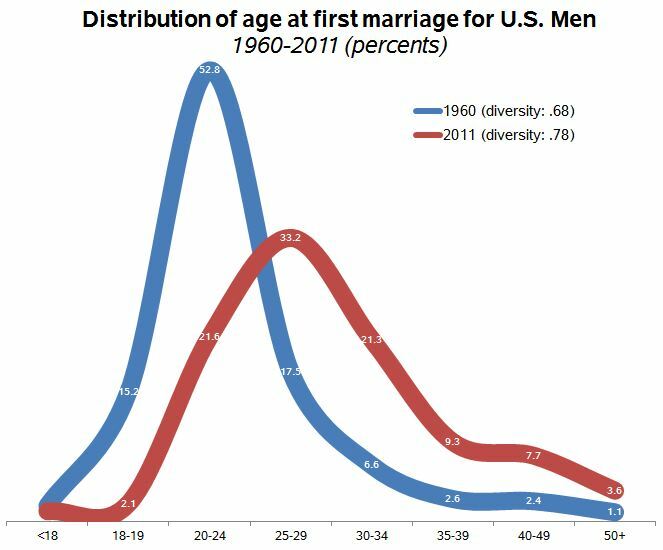 I wonder if using the 1950s as a baseline downplays some of the important categorical distinctions. For example, before WWII, if anyone had used the term, racial diversity might have meant having neighbors who were Irish, Italian, and Jewish, all of whom were not exactly White. WWII had something of a homogenizing effect, blurring distinctions between old and new immigrant groups. 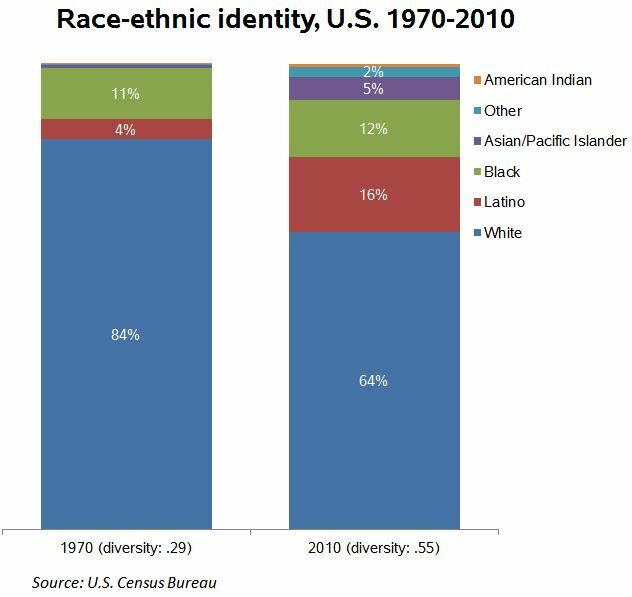 Then, the last 50 years have seen increases in new immigrant groups, who are again marked as different. 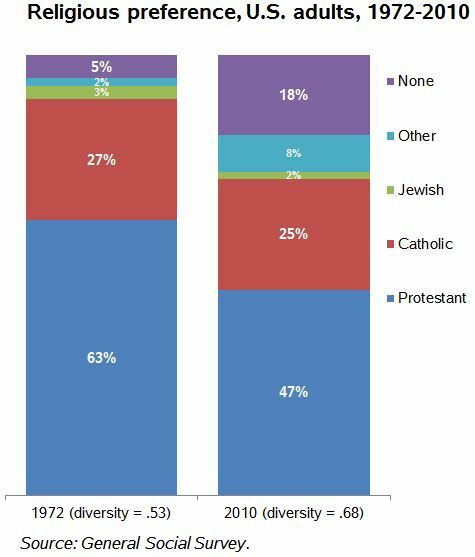 So, I guess I’m curious how we should interpret this diversity comparison. Is it supposed to be a summary measure of an average person’s experience of difference? If the Census categories map the common cognitive experience then it would work that way. In some ways that doesn’t work – Asians who pay attention to differences in national origin are an obvious example. I noticed that your first figure mentions “people of no faith excluded”. 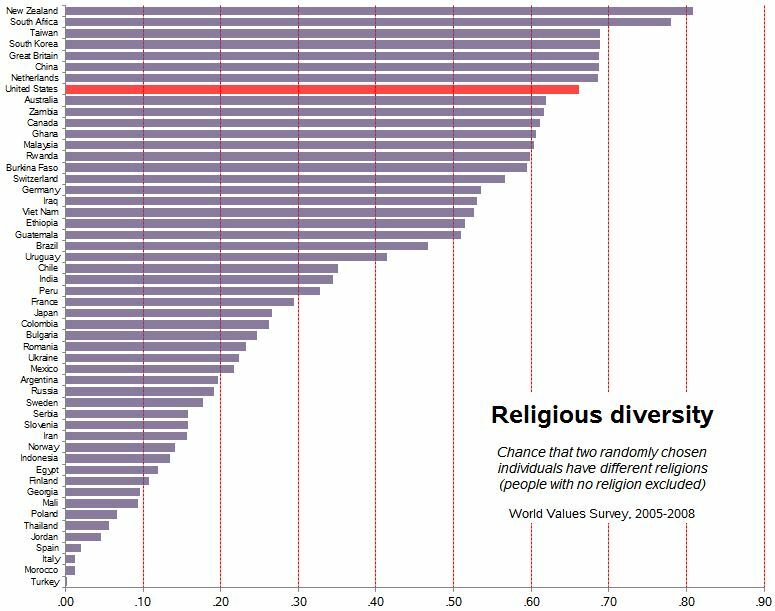 Wouldn’t that seem to create a bias reducing the religious diversity score for countries with a large population of atheists? (Though your inclusion of the “none” category in later figures seems to suggest that this is a data-source limitation). Another lesser-known fact is that the number of male to female undergraduates in the United States was about at parity from 1900 to 1930. 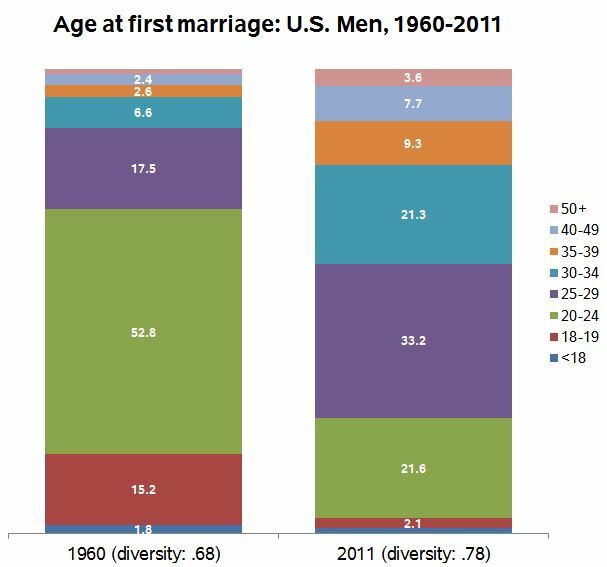 Male enrollments began to increase relative to female enrollments in the 1930s and they soared directly following the end of World War II. A highpoint of gender imbalance in college attendance was reached in 1947 when undergraduate men outnumbered women 2.3 to 1. From then on female college enrollments began to catch up, especially in the 1970s. Gender equality was again reached around 1980 and subsequently women overtook men in college enrollments and graduation rates. My graph of the US is from the General Social Survey, which has “none.” The World Values Survey seems to exclude those. I agree this is a bias, assuming there are different proportions of non-religious people in different countries. I’m skeptical of this particular measure of diversity. Imagine a population with five religions, all equally represented. Compare to another population with ten religions, all equally represented. 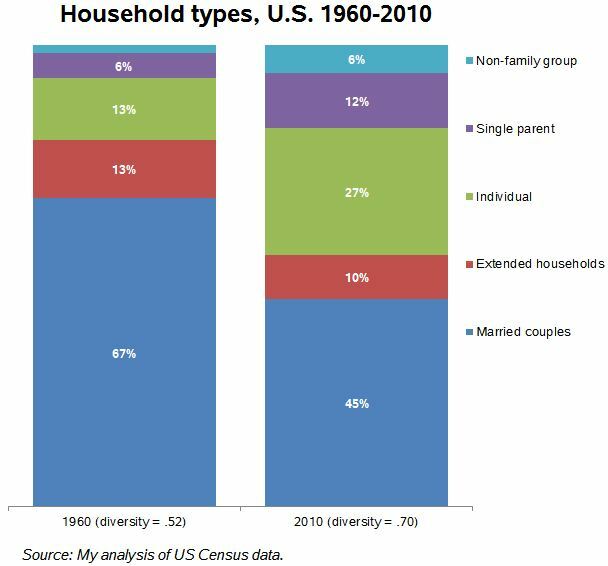 Intuitively, we would say that the second population is *twice as diverse* as the first. However, by this measure, they would be extremely similar – one with a value of 0.8 and the second a value of 0.9. The “probability two randomly sampled individuals will be different” approach seems to work best when the two populations being compared have the same number of categories. However, when one population has more variants than the other, I’m unsure this number properly embodies our intuitive understanding of the word “diversity”. Yes, it’s best for direct comparisons with the same number of categories. As you point out, there is a different upper value of diversity depending on the number of categories. Still, that interpretation still holds, so as long as you know what you’re measuring it may be useful. One adaptation I’ve used is to just rescale the index so that 0 is complete concentration and 1 is even distribution across the given categories. That might introduce other problems I haven’t thought of though. These are great representations of data, and being able to “see” the numbers is often a great teaching aid. My question/concern is with representing Catholics and Protestants as two distinct religions. From an insider perspective (that is, someone in either community), that makes some sense. Although, if we believe any of the ‘culture wars’ discourse, that division becomes less salient, even from the insider view. Further and perhaps more importantly, taken from an outsider perspective, do Catholics and Protestants really look that different? Do Muslims, Jew, Hindus, and Buddhists (et al.) experience those two groups as truly distinct? When we discuss equality and religion, especially in the US, we’re generally talking about the rights of Christians vs. non-Christians. Same goes for most of Europe. This of course reflects the sociological profile of who founded and still largely defines the policy of Western Europe, the US, and a good chunk of the Commonwealth. Granted, the historic divisions between Catholics and Protestants in Canada, the Netherlands, etc. are real, and matter. But do those divisions matter in the same way to religious minorities? Does “diversity” mean the same thing to all people? If you’re part of a minority religious community–especially in a secular state, I suspect not. Nonetheless, very interesting data. Thanks! Pity. Diversity is the end of any civilization. We will watch if your country proves an exception, though historical experience tells me otherwise.